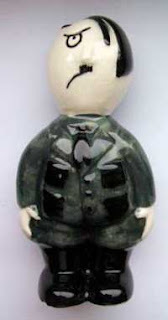 Whilst conducting my regular ebay trawl for a reasonably priced Carlton Ware bird dish, I came across a Carlton Ware Hitler! Dave was quite taken with it and said he was willing to pay up to £30 for it. Always happy when Dave takes an interest in these things, I thought I'd better check it out first before placing a bid. They are not made by Carlton Ware, but by whoever it was who acquired its master mould after receivership in 1989. Buyer beware!I'm glad I did my research. This particular auction even has a picture of a stamp on its base which 'somebody' has commented dates it between 1906 and 1927 (well before the second world war). It would be my guess that someone has taken one of the pieces produced in the 90s and faked the stamp to make it appear older. Thanks for the 'heads up'. It still has a certain charm about it tho (and I'm a half jew lol). 1950s - I feel the same. The site I linked to claimed prices being asked were around £65. I would feel SERIOUSLY ripped off if I had thought it was war era and it was actually 1990s. I didn't mention it on the auction listing, partly because I thought bidders might already realise this. If people were willing to spend big bucks you just gotta hope they know what they're buying. I posted a while ago about how those Dresdner Bank elephants (of which I own a few) were not actually designed by Luigi Colani. I didn't care WHO they were designed by I just like the design but it still irks me that they are advertised as such. Yeah, you know how much I hate to get ripped off by fakes too. it's one thing if you are aware of it another if you didn't and found out after the fact. I'm sure some sellers are genuinely unaware if some things are fakes, but others, like the blue "eames 1960" face sculptures I got, were so obviously new, I felt the seller ripped me off grrrr. But you could not tell until you held them in your hands.